Scoop neckline and sleeveless style of this dress is great one to match summer garden or outdoor weddings. All the body is made of ivory cotton. The decoration of navy blue sash accents the waist part and covered buttons is beautifully flattering on the zipper back. This ivory cotton wedding little girl dress features a special scalloped hem that adds more fun. Your girl will surly have a sweet look in this style. Tags: ivory cotton, navy blue sash, scoop neckline, sleeveless, buttons, scalloped hem. Scoop neckline and sleeveless style of this dress is great one to match summer garden or outdoor weddings. All the body is made of ivory cotton. The decoration of navy blue sash accents the waist part and covered buttons is beautifully flattering on the zipper back. This ivory cotton toddler flower girl dress features a special scalloped hem that adds more fun. Your girl will surly have a sweet look in this style. 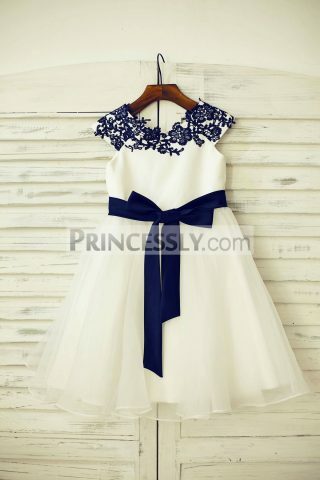 Be the first to review “Sleeveless Ivory Cotton Flower Girl Dress with Navy Blue Sash” Click here to cancel reply.